The Laterally Primed Adaptive Resonance Theory (LAPART) neural networks couple two Fuzzy ART algorithms to create a mechanism for making predictions based on learned associations. The coupling of the two Fuzzy ARTs has a unique stability that allows the system to converge rapidly towards a clear solution. Additionally, it can perform logical inference and supervised learning similar to fuzzy ARTMAP. 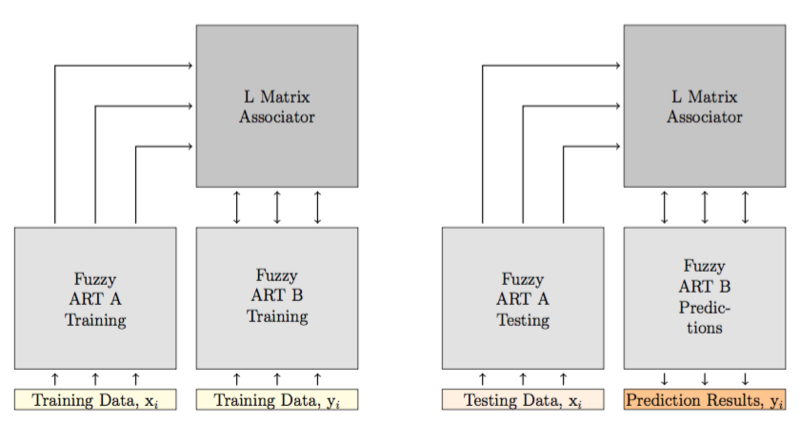 Figure 1 LAPART training (shown on the left side) uses two Fuzzy ART (A&B) algorithms connected by an associator matrix (L). During training inputs xi are applied to the A-Side while yi inputs are presented ot the B side. The algorithm then produces templates and an L matrix. The testing processes (shown on the right side) has the same structure as the training but applies previously unseen testing data (xi) to the A-Side. The algorithm then produces outputs on the B-Side that are the prediction results.